Last year, Space NK Apothecary had the ultimate GWP event for the Holiday season - a whole advent calendar, with 25 products inside. This year, they've been equally generous with their Holiday GWP - the gift is a set of 12 crackers, containing 26 beauty products. And yes, this ships worldwide! Like last year, the GWP also includes a gift card for £50. 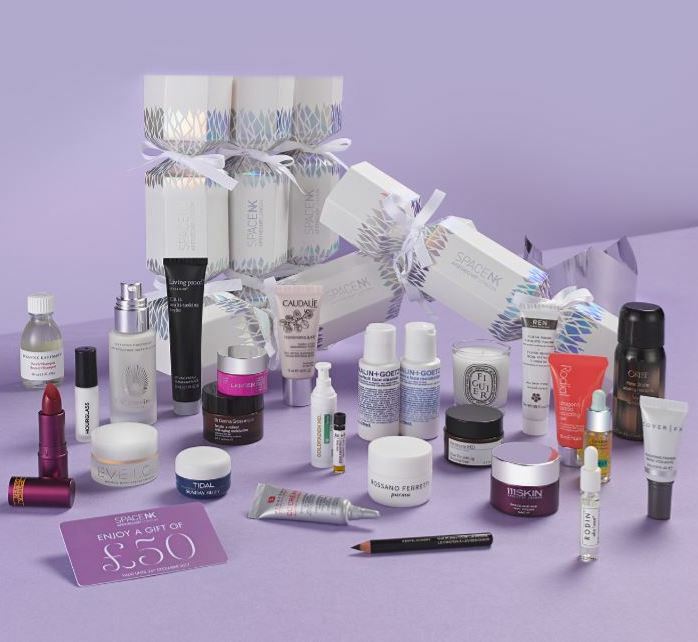 The entire set of 26 products is yours gratis when you shop on Space NK for £250, with code PARTY2017. I'll tell you what the crackers contain. Scroll down for the contents of Space NK's Party Piece Christmas Cracker Gift Set, for Holiday 2017. UK customers will receive Oribe Freestyler DLX, and Perricone Face Finishing Moisturiser in lieu of the Cover FX and the Becca. This is incredible - it's a whole Advent Calendar in cracker form, free! There's Omorovicza, 111 Skin, Sunday Riley, and a bunch of other high-end brands. There's skincare, makeup, hair care, and bath and body products. I'm especially excited about the gift card - it means I can treat myself to something extra for a whole £50 - maybe a nice palette, or some luxurious skincare. By Terry Compact Expert Dual Powder (Watch out for my review). Or maybe you'd like something from their new Christmas shop, here? To get your set of Space NK Christmas Crackers, go here. Use code PARTY2017 at checkout, and the gift is yours for keeps! Space NK ships worldwide, and postage is free on this GWP order. Hurry - Space NK's GWPs usually sell out in three days, tops, and this will be no exception!